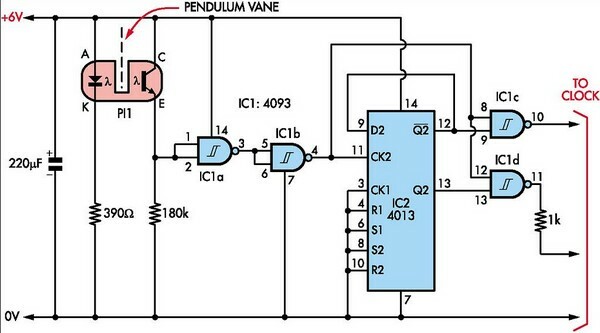 Here's how to build a pendulum-controlled clock which can be made really accurate. Retro? - yes, but an interesting project all the same. You'll need a spare quartz clock which must be adapted by first isolating the two pads on the chip which lead to the coil. You then have to connect wires to these pads and feed them out through a hole in the case (see SILICON CHIP, December 1996, p38, for full instructions, or October 2001, p37, for brief notes.) You'll also need a spare battery driven pendulum from another, or the same, clock. As originally used, these pendulums are for appearance only and play no role in timekeeping. The salvaged unit should be mounted on a substantial vertical backboard. You'll find that the pendulum swings pretty fast and it must be slowed down by adding weights near the lower end. However, it's not the mass of a pendulum that controls its rate - instead, it's the distance from the support to the centre of mass that counts. The aim is to make the pendulum operate so that it takes exactly 1s for a full "to and fro" swing - ie, 0.5s "beats". Fine adjustment on mine was made by adding an adjustable (up and down) weight to the pendulum rod. This consisted of a small G-clamp fabricated from a brass strip and held by a small screw. At the bottom end of the pendulum attach an inverted T-shape aluminium vane, about 10mm wide and as thin as possible. This should be painted black. This vane is used to trigger a photo-interrupter which is attached to the backboard. The lengths of the arms of the "T" are made so that when the pendulum swings one way, the interrupter triggers - ie, the light is no longer blocked. Conversely, when the pendulum swings the other way, the vane must continue to interrupt the light. This means that, with the pendulum swinging in 0.5s beats, we get a short pulse from the photo-interrupter at 1s intervals. This pulse is inverted by IC1a and inverted again by IC1b which then clocks IC2, a 4013 flipflop. IC2 alternately produces 1s-long pulses at its pin 12 & 13 outputs. These outputs are then fed to IC1c & IC1d respectively, where they are gated by the short pulses on pin 4 of IC1b. This produces two short pulses to drive the clock in alternate directions at 1s intervals. And that's all you need to drive the clock. Alternatively, this circuit could be a master clock and could be used to drive several slaves, all remaining in time. And model train enthusiasts could drill one or more holes in the vane to make their "railway" clocks run at what ever speed they need. The circuit can be built on a small piece of strip board. Note that the photo-interrupter should be mounted with the photocell facing the backboard. This minimizes the risk of interference by ambient light. The photo-interrupter is available from Jaycar - Cat.ZD 1901. A footnote for horologists - if you have a clock with a Hipp butterfly escapement, you could rid yourself of the trailing arm and contact arrangement and replace it with a vane and photo-interrupter set so that as the arc of the swing becomes too small, a pulse is missed. This could then be detected by a 555 missing pulse detector circuit which would then energize the impulsing magnet.